I am obsessed with panna cotta at the moment. Perhaps it has something to do with it being a milky jelly that would require a jellyspoon?! More likely because it’s one of the easiest recipes to make and the easiest to get very wrong. This all started with a panna cotta I decided to bring to a Mother Porkers’ Dinner where we were cooking from Pork and Sons. I wanted to bring a piggy dessert and decided that gelatin probably contained porky something! So I made a little panna cotta – can’t remember the exact recipe I cooked from because it’s eclipsed by how awful the resulting puddings were. I used far too much gelatin and the rubbery concoctions were only good for making obnoxious farting noises with the spoon. From this devastating experience I knew I had to redeem myself. So I chose to ask Michael Mina for his delicious chocolate panna cotta recipe for my book Made in America. Getting the right balance of chocolate goodness without the panna cotta loosing its wobble has been a challenge but I think I managed it, Mina’s chocolate puddings are a modern version of a chocolate blanche mange recipe from the late 1800s. Because the milk chocolate in the recipe will set solid it’s a tricky balance of wanting the panna cotta to set but not wanting to repeat the Pork and Sons embarrassment. When I had to make something from Amander Hesser’s wonderful tome The Essential New York Times Cookbook: Classic Recipes for a New Century for a Spoons dinner I knew it was time to take on yet another panna cotta recipe. Hesser’s recipe is based on a Gramercy Tavern recipe that appeared in the New York Times in 1996. 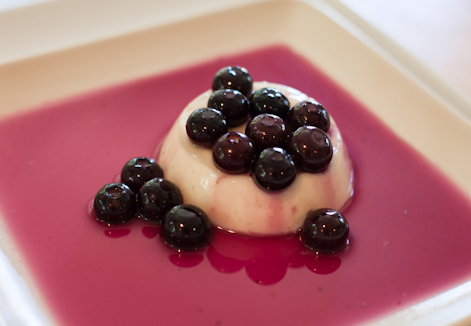 I poured the panna cotta into pretty little pink votive glasses (from IKEA) and then added a small amount of blueberries that had been steeped in the star anise syrup. I adapted the recipe – not a lot but a little and I can’t stop eating it! 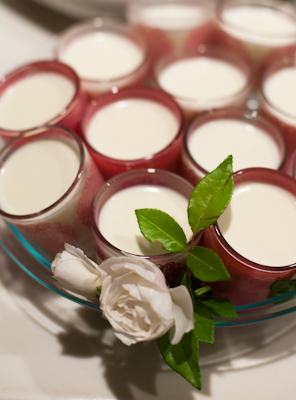 I even plucked up enough courage to serve panna cotta again to my friends – the German who’s the most critical was impressed with the wobble – particularly when I let it be known that I had used powdered gelatin and not sheets. This weekend for my Mother Forkers’ Italiano dinner I am taking on yet another panna cotta recipe – this time from Georgio Locatelli’s book – Made in Italy: Food and Stories . What’s interesting about his recipe is that it uses milk – no cream – and adds rosewater and vanilla for flavor – and uses gelatin sheets and not powder. The panna cotta is then cooled in a bowl rather than individual serving dishes and spooned out to serve as a scoop with a delicious sounding orange cake – I’ll let you know how it turns out. 1. In a medium saucepan heat the cream and 1/2 cup of sugar over medium heat until the sugar dissolves. 2. In the meantime, sprinkle the gelatin over the cold water and let it bloom for 5 minutes. 3. Stir the gelatin into the cream until disolved. 4. Stir in the buttermilk, salt and vanilla bean paste. Remove from the heat. 5. Pour the mixture into a jug and fill 6 6-ounce bowls or 12 mini votive glasses. Refrigerate and let set for about 2 hours. 6. To unmold bowls, let sit in a bowl of hot water for 2 minutes and then turnout onto a plate. The panna cotta should easily slide out – if it doesn’t return bowl to the hot water for 30 more seconds. If using mini glasses I like to serve the panna cotta straight from the votive glasses. 7. Let stand at room temperature for 1 hour before serving. 8. 20 minutes before serving heat 1/2 cup water and the remaining 1/2 cup of sugar in a small saucepan until boiling. Remove from the heat, add the blueberries and the star anise pod and let steep for 20 minutes. 9. 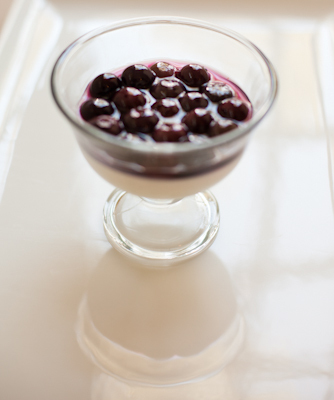 Remove the star anise, cover the panna cotta with the cooled blueberries and syrup and serve. What I love about panna cotta is that it’s such a blank slate — wonderful on its own, but able to be dressed with so many flavors and sauces and accompaniments. I used David Lebovitz’s recipe, which is perfect, natch. yes I love that about it too – tonight vanilla with star anise berries on top – had thought about the rose water but don’t really like my dessert to taste of bubble bath! Thanks for sharing this recipe for the perfect panna cotta – something I have never tried to make but certainly should. maybe cos it’s not that healthy ; ) but definitely easy – perhaps you could do a light non-fat version? I’ve always wanted to make panna cotta. This is inspiring me!